Finally- A cabinet system designed to cost effectively replace fluorescent lamps! 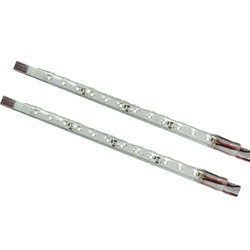 This Qwik Stik is available in for shallow cabinets, 12V DC - so there is only a need for one type of power supply. Qwik Stik fits into existing HO T12 lamp sockets or can be used with our easy to install mounting hardware for new sign construction.